Bring the Afghani farmers and their families onside, instead of pushing many into the arms of the Taliban. Deprive the Taliban of one of their major sources of income (opium and heroin sales) … income which they use to buy weapons and lure recruits. On this last point, according to the above report $0.6 billion (approximate average) has been spent by the US each year for the last 13 years on failing to suppress the Afghan opium crop. 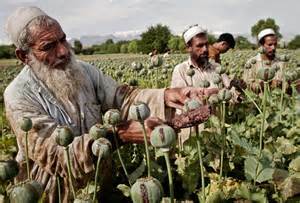 This means that the US government could have bought the entire Afghani crop this year for around $2.4 billion net (i.e. including the $0.6bn saving this year on what’s been spent as an annual average during the last 13 years) and sold it to pharmaceutical companies for processing into a variety of opiate-related drugs for medical use. How much was spent in the USA in the last 12 months on buying opiate-related drugs for medical use? I’ll wager it was more than $2.4 billion. Come to mention it, how much was spent by the National Health Service in Britain on buying opiate-related drugs? How much was spent by every government in the world combined? None …. except (politically speaking) having to deal with a predictable backlash from some sections of the general public (see below). In the meantime, governments around the world continue to prosecute a misguided and costly ‘war on drugs’ despites many decades of failure stretching at least as far back as the prohibition era in the USA. They do so mainly because it accords with popular public opinion (for which read popular ignorance and stupidity in this instance). This is another way of saying that the governments concerned lack true political leadership, namely a leadership that would move ahead of popular opinion and do what many of the politicians concerned know to be right, namely to end a fruitless, damaging and expensive policy and replace it with an entirely more rational approach.